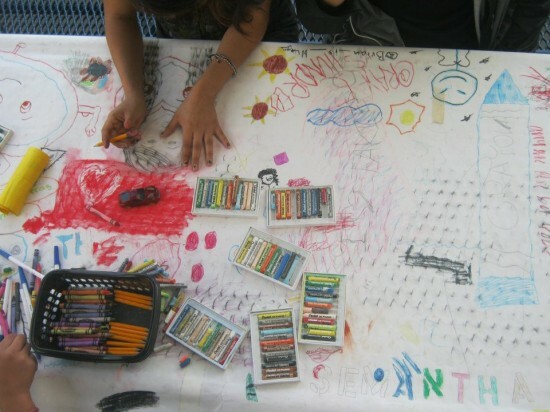 Getting creative at the East Los Angeles Arts Festival 2012. Big Draw LA is coming to Little Tokyo on Tuesday, Oct. 2, as part of Tuesday Night Cafe. Tuesday Night Cafe presents “Who Lights Up Your Life?” on Tuesday, Oct. 2, as part of The Big Draw LA Initiative. Event starts at 7:30 p.m. in the Aratani Courtyard, 120 Judge John Aiso St., Little Tokyo. Open mic sign-ups begin at 6:45 p.m.
“Who Lights Up Your Life?” is a visual arts project fueled by Tuesday Night Cafe (TNC), an interdisciplinary performance, art, and community space in Los Angeles’ Little Tokyo. On the first and third Tuesday of the month, spring through fall, TNC maintains a free, positive, and inclusive space with a focus on new work from Asian American/Pacific Islander communities and from the Greater Los Angeles area. A completely volunteer-run endeavor for over 14 years, TNC has become one of the longest-running public art spaces in downtown Los Angeles. As part of The Big Draw LA initiative, on the evening of Oct. 2, “Who Lights Up Your Life?” will illuminate the visual arts at TNC and engage audience members in a fun, positive way as co-creators of the space. Over the course of the evening, performers and audience members will be invited to draw “who lights up their lives” on white paper bags, which will be transformed into luminaria lanterns that will light the TNC stage. In conjunction with the theme of that evening’s TNC, “LGBTQ Family Night,” the project will highlight the wealth that people bring to our lives, creating a glowing visual statement of appreciation, gratitude, and love. Hosted by Sean Miura and Allison Santo, featured artists include Michelle Lee and Patty Chung, RiKu Matsuda, Manoj Kumar, Jenny San Angel, Erin O’Brien, Team Millenia. For more information, visit www.thebigdrawla.org or call (213) 629-2787.